Wanted to have an ability to customize the appearance of status bar of your iPhone? Now with a new tweak named as CleanStatus from Cydia, users will be able to clean or tweak them based on own preference, freeing up some limited space that you have on iOS devices. For the start, just head over to Cydia (assuming that you already have your iPhone jailbroken). On the main screen, tap on ‘Search’ and key in ‘CleanStatus’ and start the searching. You will notice the utility appeared in the list and tap on ‘Install’ to install the app into your iOS devices. By now, you should be able to find a new configuration with the name of ‘CleanStatus’ under Settings for toggling selections. 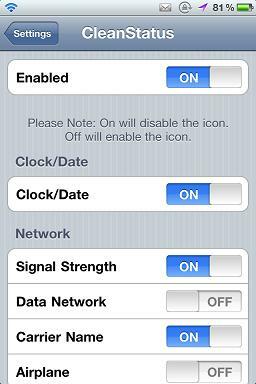 For instances, under the setting menu, there are Clock/Date, Signal Strength, Data Network, Carrier Name, Battery Performance, Rotation Lock and many more and simply toggle the desired one will activate the respective status icon for viewing. Take note that toggling ON will disable the icon whereas OFF will enable the icon. While it doesn’t seem to help users much except customizing the appearance of your iOS devices’ status bar, but this is no doubt a simple tweak that can make your iOS devices look different from the rest. CleanStatus is available for free download under Cydia from ModMyi,com so do grab one to hide up to 19 different icons on your iOS devices.